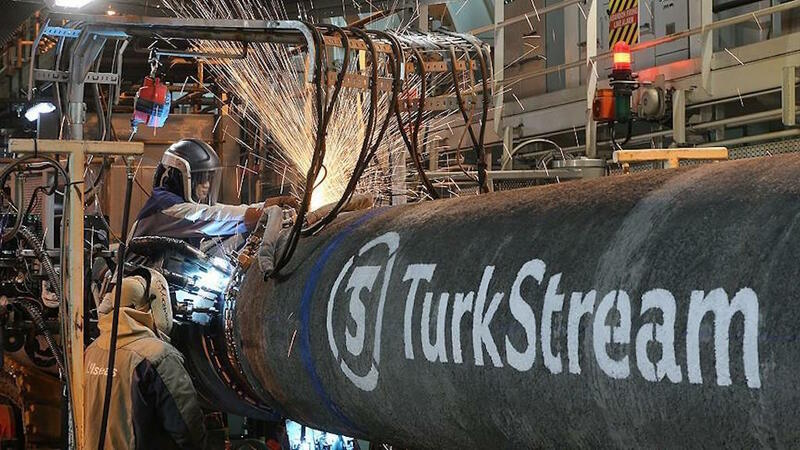 The TurkStream natural gas pipeline project’s spokesperson Asli Esen announced on Wednesday that its second line is over 45 percent completed. At a news conference Esen informed the press that the giant construction vessel, Pioneering Spirit, which is continuing works on the Black Sea, has finished around 46 percent of the pipelaying for the second line as of Aug. 7″, Anadolu has reported. “The vessel completed 435 kilometers of pipelaying, and with the first line in total 1,369 kilometers of pipes were laid,” Asli noted. The pipeline will run from Russkaya compressor station near Anapa in Krasnodar Region across the Black Sea to Kıyıköy, Eastern Thrace coast. It is replacing the cancelled South Stream project and consists of two lines. Each of the lines has a length of 930 km and a total capacity of 31.5 billion cubic metres of natural gas per year. Matteo Veronesi, TurkStream’s permit manager, spoke to journalist and elaborated the company’s plan regarding the environmental impact the giant construction will have. He clarified it has been carefully thought and measures have been taken so that nature will be affected as less as possible. “The project area was selected so that it doesn’t have an impact on Longoz forests and protected areas. The Longoz forests are located 15 kilometers to the north, as specified in the TurkStream EIA Report. In line with the requirements of the Turkish legislation, the company paid the forestry permits fees, which include reforestation fees. In addition, the company commissioned an independent study to determine the approach to afforestation from the Istanbul State University Forestry faculty. Subsequently, we signed an agreement with the General Directorate of Forestry and Turkish BOTAS for the implementation of the afforestation scheme. Although the definitive number of trees to be replanted will depend on the scheme to be implemented by the Forestry Directorate, we anticipate an afforestation ratio of minimum 1 to 5. This means that at least five trees will be replanted for every tree lost. The project has committed to minimizing the impacts to local ecology. A number of measures have been implemented, including avoidance of ecologically sensitive and protected areas, relocation of over 1,100 individual animals from the construction area, site preparation before bird breeding season, ecological training and induction for relevant construction workers. Ecologists are undertaking an ‘environmental watch brief’ during construction.